Donation from Barton County Memorial Hospital to be used for Trula Cain Memorial Dog Park. On Wednesday, June 29, Barton County Memorial Hospital, represented by Sandra Dickey, presented a check for $510 to Animal Control Officers Sandy Alexander and Austin Eaves to be used for the Trula Cain Memorial Dog Park. 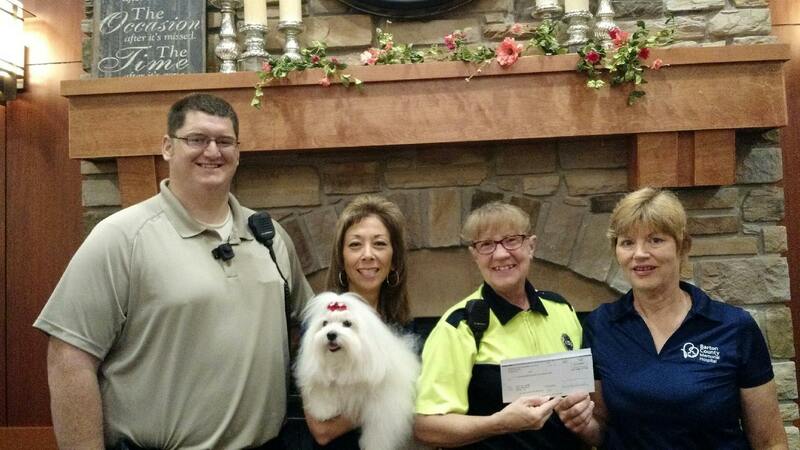 The money was raised by BCMH, sponsored by the BCMH Pet Therapy Program, from the sales of pet calendars. Members of the community are asked to submit photos of their pets; the winners are then featured on the pet calendar. Pictured in the photo are ACO Austin Eaves, Catherine Hibdon with her pet therapy dog, Willow, ACO Sandy Alexander and Sandra Dickey. We want to express our gratitude to Barton County Memorial Hospital for this very thoughtful endeavor.